The time has come. 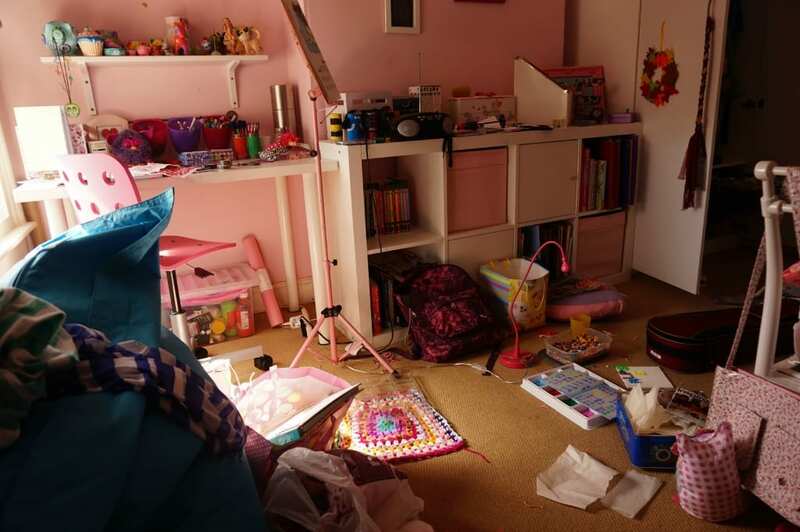 My 10 year old doesn’t want a pink bedroom anymore, so we’ve been giving her room a makeover after we recently had some new windows fitted. The old ones were really not effective anymore, leaking and draughty. If there was ever a reason why you need double glazing windows, this is it! Anyway, with the decor, I knew the time would come and I’m fine with it. The room was looking a little tired and dated anyway, and she’s ready for something more mature. So I’ve spent some time looking for a style, and colour palette that she’d be happy with, that I love too. And in the next few weeks I’ll be sharing some of our decorating and design projects. We’ve been trying out some new paint on the walls, have scoured the attic for old pieces of furniture and given them a new lease of life, designed some wall art with the Cricut and lots more. There’s still plenty to do but it’s starting to take shape. Firstly I’m going to show you something I’m sure many of you are familiar with: The Lived-In Look! 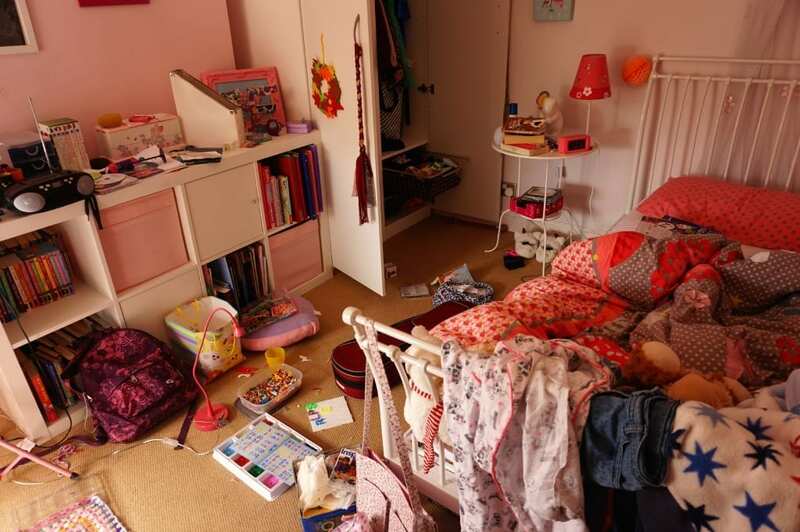 Our house isn’t perfect, it’s a normal real home and it gets messy. Very messy! The 10 year old loves clutter, possessions and treasures. You can see crochet, music, clothes and Hama beads galore here; she isn’t a tidy person no matter how much I’ve tried to teach her and so we just live with it and hope one day she’ll stop scattering things on the floor. The room is a good size and we aren’t changing any of the furniture or the layout, just updating the look. 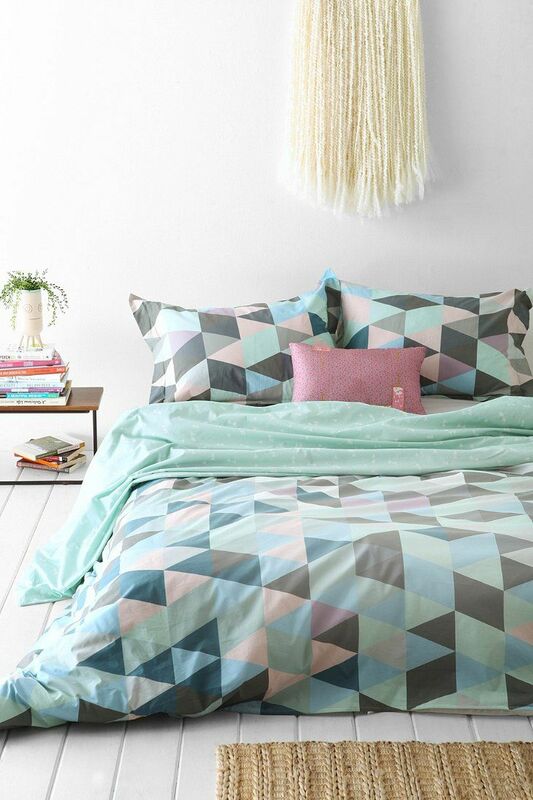 We have decided upon a Scandi inspired theme, with geometric, graphic prints in a mix of these colour palettes. I have pulled the coral, mint and greys together to create something fresh, modern and young person friendly. She loves the idea of the colour combination, and has plenty of ideas of her own. Together we’ve been scouring Pinterest and favourite websites for inspiration, and here are some of the images we are using to bring the look together. We want it to look fresh and clean, fun, colourful and organised and this bedding is a great start. 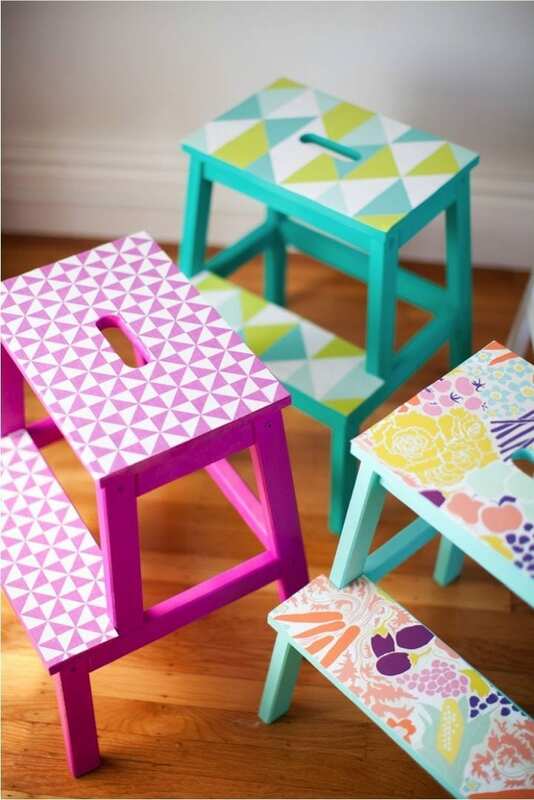 These colourful stools are great inspiration for the look we want to create and say it all really. We hope to add these kinds of fresh bold, geometric designs across the room. If you haven’t come across Vintage Revivals yet, you must go and take a look. It’s a stunning US blog full of innovative, creative and contemporary home DIY projects, including this sharpie wallpaper. 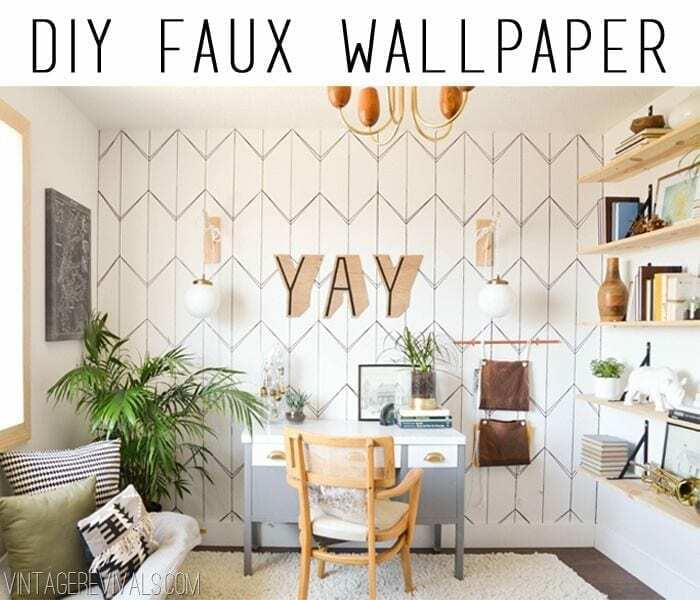 Now I’m not about to draw all over our walls (it certainly wouldn’t look as great as this) but I may well use our Cricut Explore to create a wallpaper effect on the feature wall. 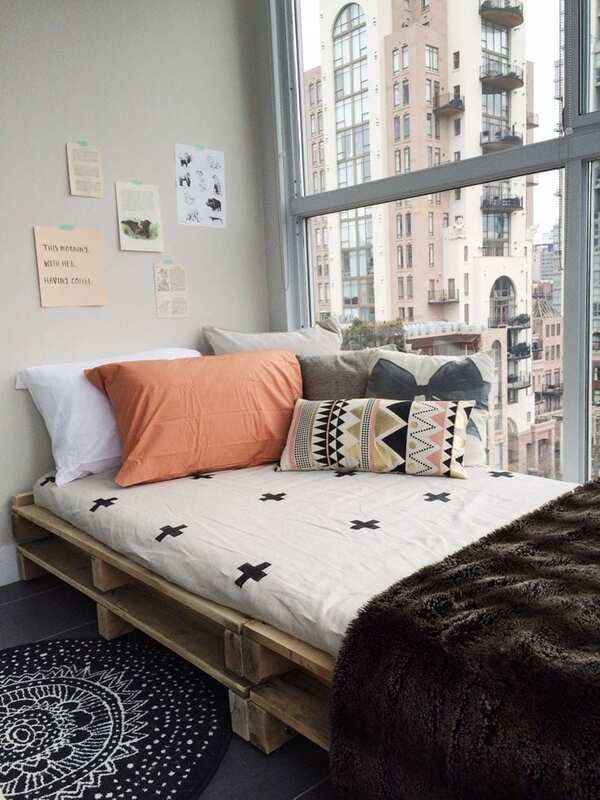 Although we have a bed frame and won’t be creating a day bed from pallets, I do want to give her more of a day bed feel so she can enjoy hanging out with her friends in the coming years. So, I’m buying up inexpensive cushions (what a chore!) and also looking at creating some of our own, again using the Cricut. So I think you get the idea from these images, on the kind of look we’re going for and what we’re hoping to achieve. Over the next few weeks I’ll start sharing some of our individual projects, and then do a final reveal once everything is complete. The curtains are going to be a while as we’ve only just ordered the fabric, and it has to be brough in from Sweden! So watch this space, lots more to come on creating this contemporary, Scandi feel Tween bedroom. I can’t wait to see how it all turns out! It’s also great you’re giving your daughter some input into the design of her room, which is something I was never given. I think it goes a long way towards future decision making and autonomy. Best of luck with your project. Good luck with this, I’m sure you’ll do a great job! I love the colour palette choices and the geometric design ideas are great. Look forward to seeing the end result.